A native of Cocke County, TN, she was daughter of the late Demper Lee and Lydia Davis Perryman. She was a member of East Belmont Church of God for over 40 years and worked in textiles. A graveside service will be held at 11:00am Wednesday at Gaston Memorial Park with Reverend Danny Peterson officiating. Survivors include her sons and daughters in law, Joe and Carolyn Williams of Belmont, David and Wanda Jenkins of Calabash, Dan and Janell Jenkins of Kings Mountain; sisters, Shirley Hager of Belmont and Eula Mae Summerville of McConnell, SC; 6 grandchildren 12 great grandchildren and 4 great great grandchildren. In addition to her parents, she was preceded in death by her husband, Grady Jenkins, son, Jack Williams and grandchildren, Brian and Denise Williams. 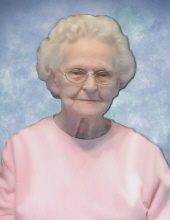 In lieu of flowers, memorials may be made to East Belmont Church of God, 320 Catawba Street, Belmont, NC 28012. The family would like to express a special thanks to Lincoln County Hospice, Stanley Total Living Center and special friend, Gisela Cook for their special care given to Pauline. Condolence messages may be sent online at www.mcleanfuneral.com. McLean Funeral Directors of Belmont is serving the Jenkins Family. To send flowers or a remembrance gift to the family of Pauline Perryman Jenkins, please visit our Tribute Store. "Email Address" would like to share the life celebration of Pauline Perryman Jenkins. Click on the "link" to go to share a favorite memory or leave a condolence message for the family.